Hi everyone! Shannah, from Just Us Four, here back again to share a recipe with you! I hope you all are enjoying summer as much as I am! We spend as much time as possible outside and try to have a bunch of picnics too. Pasta salad is one of those quintessential summer foods and pops up at pretty much any picnic or BBQ. 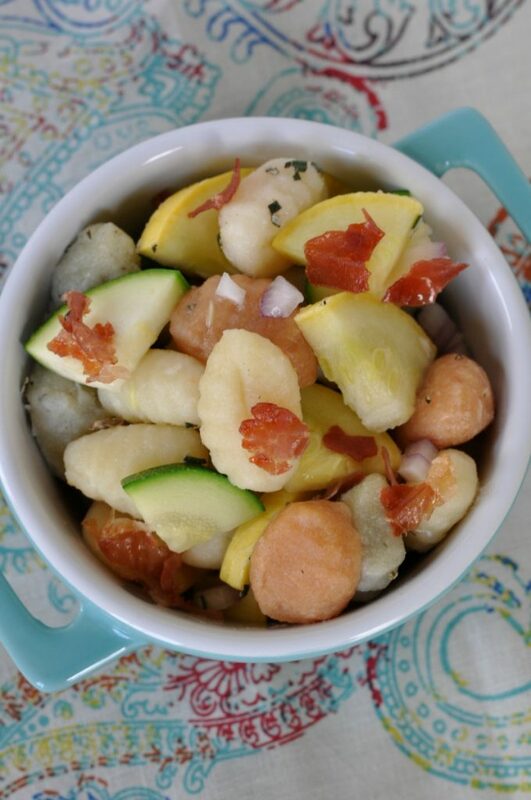 I wanted to change up the regular pasta salad though and decided to make a gnocchi salad instead. Gnocchi is a little different than pasta because it potato based. It is so delicious though and cooks extremely fast which makes it great for summer because it won’t heat up your kitchen as much. I have heard it is super easy to make from scratch too but I typically buy it from the store. 1) Preheat oven to 400 degrees. Line a baking sheet with foil. Place prosciutto on baking sheet and bake in oven for about 10 minutes or until the prosciutto turns crisp. Remove from oven and let cool slightly before crumbling into pieces. 2) Bring a large pot of salted water to boil. Cook gnocchi according to package directions. 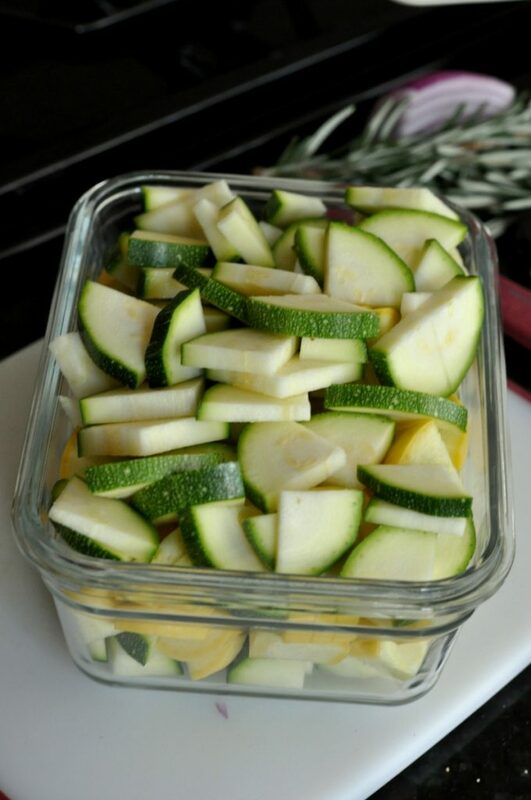 With one minute of cooking time left, add squash to water and finish cooking gnocchi with the squash. Drain and rinse under cold water. 3) In a small bowl, whisk together salt, pepper, white wine vinegar, olive oil, mustard, rosemary and oregano. 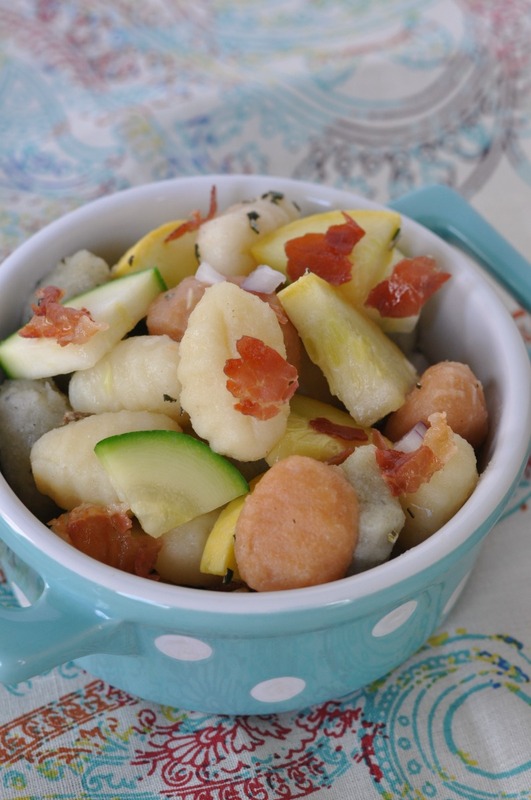 4) In a large bowl, combine gnocchi, vegetables, cheese and crumbled prosciutto. Pour dressing on top and toss to coat. Refrigerate until ready to serve. 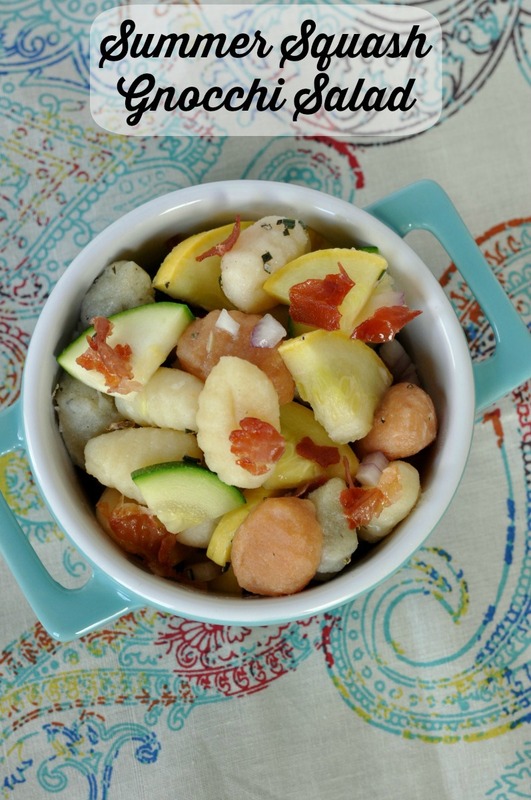 This gnocchi salad is one of our favorites. The saltiness of the prosciutto is so delicious. If you don’t have it, feel free to substitute bacon. The bacon will add a little bit of smoky flavor that prosciutto doesn’t have. Enjoy your summer and be sure to come by and visit me over at Just Us Four to get even more recipes for summer! I’ve never known what Gnocchi was… except the cat on Curious George 🙂 I also have never had a cold zucchini dish. I’ll have to try it!